For those of you that follow Must Love Horses social media, you know how obsessed we are with Tracey Buyce's stunning photography. Every single photo captures the unique beauty of the individual horse. Doesn't matter rain or shine, summer or winter, Tracey is able to make us long to stand next to her and take in that special moment. We were curious on how Tracey and how she does it, so we were excited when she agreed to be interviewed. 1. What do you love about horses? The unique style of their communication, their grace, the beautiful fluidity of their bodies, and their clever humor, are all aspects of equine photography that I love capturing. The power of a horse's mind, their body, and spirit are like no other, which inspires me as a horse photographer. 2. How did you get into equine photography? It was in 2012 while at a fine art wedding photography workshop in Mexico, that I was given the encouragement that I needed to fill a life long void, to balance my life. Upon my return home, I started taking lessons. A short six months later, I met one of the most important beings in my life, my very own horse, Moose. It was then that I started photographing horses. I have been able to take my twelve years of experience as a wedding photojournalist and transfer my skills to equine photography. Always seeking out unforgettable moments has been instrumental in photographing horses. Great moments are fleeting and you need to ready to anticipate, react, and document. Being patient, calm, and being able to read and anticipate emotion and movement are all skills that are essential in photographing horses. 3. What is your favorite moment or photo shoot? I have so many favorite moments, as each horse if different and bring their own unique energy to the images. I want to draw in the viewer and connect them to the unique personalities and the beauty of the horses. I want them to feel a strong emotional pull to the photograph. That emotion may be a sense of peace, joy, laughter, or beauty. It is my hope that this feeling lingers with them for much longer than just the moments they view it. 4. What surprising lessons have you learned along the way? Sometimes it takes a week at a ranch to get great images or 5 minutes in a pasture. Always be prepared and aware of your surroundings! 5. What is the best advice you can give someone wanting to pursue equine photography? Stay driven, take every opportunity to learn, and practice, practice, practice! We would like to thank Tracey Buyce for doing this interview and for the beautiful photos. If you haven’t already you need to head over to Instagram and follow her account @tracey_buyce_horses. It has some of the most beautiful horse photography from all over the United States. And if you want one of the stunning pieces for your home, Tracey sells her art work through her website https://traceybuycehorsephotography.com/. We have the Hedwig Collection and Freedom on our wishlist. Being horse obsessed, we are always at the look out for the perfect fashion, home goods and gifts that reflect our personality. 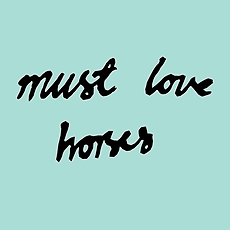 I really love Must love horses, and I love how interactive you are towards your followers and how you travel to experience more things and make your customers experiences more vivid! I really love that!! You should visit Guatemala, we have beautiful places and horses. It would be a great opportunity for you and your blog. You are a worldwide company. Congratulations on all! !